Blueberry delight. When you find a delicious recipe that also happens to be versatile, it's a baker's responsibility to try different variations of it. That's what I've done here. I've taken my cherry cheesecake bars (which were SO good and repeated without tweaks twice before I ventured out) and made a few changes. The first difference is obvious--I replaced the cherries with blueberries. Then, since I find blueberries and almonds to go so well together, I added a touch of almond extract to the creamy filling and used some of the crushed up remnants of my Honey Bunches of Oats with Almonds breakfast cereal in the crust. These changes made for a very tasty twist! Don't ask me to choose between only eating blueberries or cherries for the rest of my life, because I love them both and found them to be equally suitable for this dessert. I like the added crunch in the crust and the extra boost of flavor in the filling, too. I won't say this is better than the original, but I won't say it's worse, either. To make the crust, mix the graham cracker crumbs, cereal crumbs, melted butter, and granulated sugar together with a fork. Press the mixture evenly into a greased 11x7-inch baking dish. Remove the crust from the oven and allow to cool while you prepare the filling. To make the filling, beat the cream cheese and powdered sugar with an electric mixer in a large bowl until light and fluffy. Fold in the whipped topping until smooth, then pour the mixture onto the cooled graham cracker crust and gently spread it out. Spoon the pie filling over the creamy mixture and spread it out evenly. Refrigerate at least 4 hours or overnight--the longer, the better! *You can skip this step if necessary, but know that your crust will be quite crumbly! Sensational! I think I like blueberry version even more! Bring on the blueberries! Love this! Blueberries rule!!! Yum! You've outdone yourself Grace. The cherry version looked delish but blueberries, almond and a cereal/graham cracker crust just sounds (and looks) like heaven! I love blueberries and this recipe is so tasty! Oh my.... My mom used to make something similar, and I haven't tasted it in 20 some years. Sounds delicious, and I love the extra crunch in your crust! 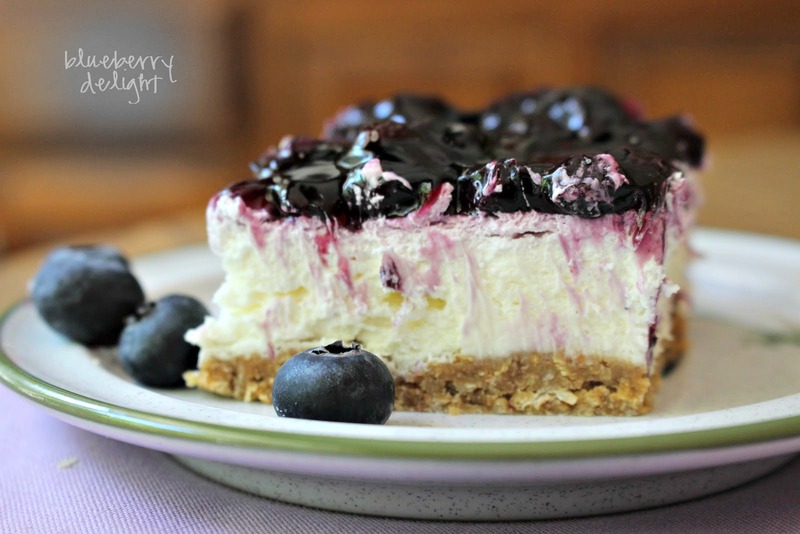 I am blueberry all the way, this looks fantastic!